June 6, 1944: The largest Allied operation of World War II began in Normandy, France. Yet, few know in detail exactly why and how, from the end of 1943 through August 1944, this region became the most important location in the world. Blending multiple cinematographic techniques, including animation, CGI and stunning live-action images, "D-Day: Normandy 1944" brings this monumental event to the world's largest screens for the first time ever. Audiences of all ages, including new generations, will discover from a new perspective how this landing changed the world. Exploring history, military strategy, science, technology and human values, the film will educate and appeal to all. 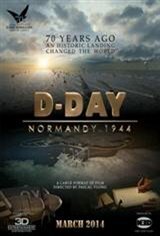 Narrated by Tom Brokaw, "D-Day: Normandy 1944" pays tribute to those who gave their lives for our freedom.